Die Inseln Cuba und Iamiaica / De Cuba et de Iamaica. 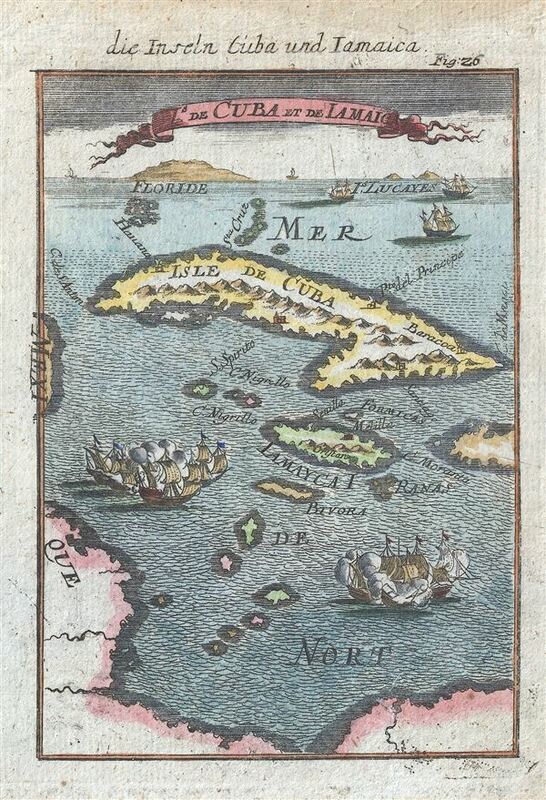 This is an attractive c. 1719 view and map of Cuba from the German edition of Mallet's Description. This map combines the virtues of a traditional map and a view. Cuba and Jamaica, the subject matter at hand, are illustrated in map format while Florida and the southern Bahamas, appearing at the top of the map, are represented in View Form. The amp extends west as far as the Yucatan and south to the Spanish Main. In the seas between Cuba and the Spanish Main there are two pitched naval battles in evidence - perhaps an early illustration of piracy which, at the time was rife in the Caribbean.